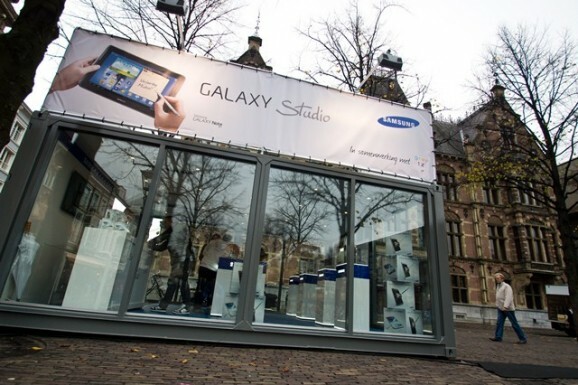 To help Samsung with their promotional tour to promote the new Galaxy Note II, GVCT Containers NL has supplied a turn key Showroom which will be moved around Holland in the next few months. The short video below shows it being transported from GVCT’s depot and installed ready for visitors. The containerized Showroom is easy to move and provides a professional appearance on any location. We hope Samsung will be succesfull with promoting their new products! For further information on converted shipping containers or special build containers please contact sales@gvct.co.uk and we will be happy to assist with your requirements. This entry was posted in Blog, Events and tagged converted shipping containers, galaxy note 2, samsung, special build containers.